I've gotten a couple of requests to show you how I deep clean my brushes. I do this on a weekly basis and go through dozens of brushes. Reason being is that I do this after every client to make sure my brushes are nice and sanitary. I've perfected the way I do it in order to save time and get the job done. I needed to clean a set of brushes anyways, so decided to film it at the same time. 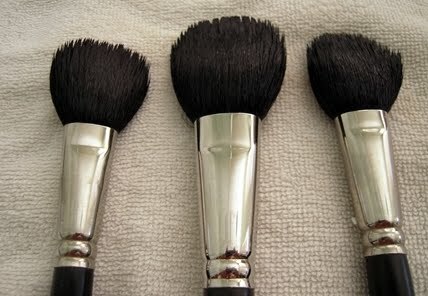 Clean three smaller brushes together to save time. I group together concealer brushes or eyeshadow brushes to make sure product doesn't transfer to cleaner brushes. I show you this in the video. If you don't have Pink Soap, use olive oil to clean lipstick brushes. It cuts apart the product and gets all the residue out. Make sure to shampoo after to get out the oil. Rest the brush heads over a counter so that they don't dry weird or mold up. Hope that helped! If you have any more tips and tricks, leave them in the comments below. Ciao bellas! It's great to see how different some people washes their brushes. Anyways, love the tips! I normally use a Tea Tree Facial Wash as it is anti bacterial and removes every trace of make up very easily. I use baby shampoo too. It makes the brushes so soft! Another great item that I like to use is a brush cleaning jar that I found in Michaels. It has gentle scrubbing pad at the bottom. I just pour the shampoo in and swirl the smaller brushes around in it, then rinse. There is also another kind that has a metal coil in the bottom which I use for larger brushes. I just tried the conditioner and it works wonders.